A group of Motherwell fans staged a protest outside the main stand against Mark McGhee’s management of the team during the Steelmen’s 5-1 defeat at home to Dundee. Well are only three points off the bottom of the table following their fourth successive league defeat. In those four games they have conceded 17 goals, taking their tally up to 53 in 26 games. The protesting fans had a “Get McGhee out now” banner which suggests they were set to protest before they watched their team wilt against Paul Hartley’s Dundee. Chants of ‘McGhee out now’ could be heard inside the stadium. Fans still watching the game showed their displeasure with songs directed at the manager, while a scarf was chucked onto the pitch at one point. An own goal had put Motherwell behind after seven minutes before Louis Moult equalised. But a disastrous 18 minute spell saw the Steelmen fold like a pack of cards as the away side netted four times. They eased to the three points in a goalless second half. McGhee has become under increasing pressure following an embarrassing defeat at Pittodrie, Aberdeen winning 7-2. The game also saw McGhee sent to the stands by the referee where he confronted a fan who was filming him. 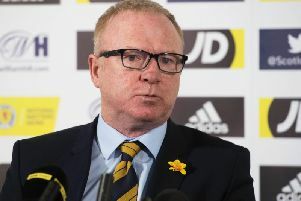 In his post-match press conference he saved his anger for fourth official John McKendrick despite being on the end of such a humiliating loss.